Four members of the Bainbridge Island Dive Club will head to the Zone E National Preliminary Championships, in July in Utah after qualifying for the meet last weekend. 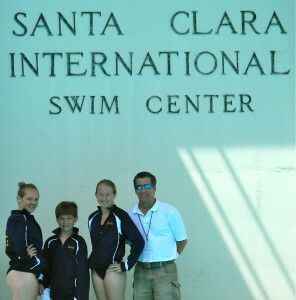 Henry Sauermann and Bryan Taylor both qualified for the 12-13 year old 1-meter and 3-meter events, Bryn Tiernan qualified for the 12-13 year old 1 and 3-meter events and Zora Opalka qualified for the 16-18 year old 3-meter. The four qualified at the USA Diving Region 10 Championships, held last weekend in Provo, Utah. BIDC sent seven divers to the event that included 208 divers from Washington, Oregon, California, Alaska, Hawaii, Nevada, Idaho, Arizona, and Utah. At the Region 10 championships, Mia Alpaugh placed 30th in the 12-13 year old 1-meter event with a score of 109.2 for seven dives and 29th (124.1) on the 3-meter. Also in the 12-13 year old 1-meter competition, Tiernan placed 25th on the 1-meter with a score of 179.7 for seven dives, and in the 3-meter event, earned a qualifying score of 179.7, to finish 17th. Sauermann placed ninth on the 1-meter board in the age 12-13 year old division, scoring 119.2, and seventh place in the 3-meter event with a qualifying score of 189. Brian Taylor placed 8th in the age 12-13 year old division 1-meter event with a score of 178 for eight dives, and ninth in the 3-meter event with a score of 171.45. In the 16-18 year old girls one-meter event, Jackie Hellmers was 53rd with a score of 82.8 for five dives, and placed 44th in her 3-meter event with a score of 119.85. Cameron Rouser dove in the 16-18 year old girls 1-meter event, earning a score of 139 for five dives to finish 41st. She was 40th in the 3-meter event, scoring 132.25. Also in the 16-18 year old girls events, Opalka scored 144.95 on the 1-meter board for 40th place, and in the 3-meter event with a score of 378.4 for 10 dives, placing 16th. The 2016 Zone E National Preliminary meet will take place July 4-10 at University of Utah’s HPER Natatorium in Salt Lake City, Utah. Bainbridge Island Dive Club will compete in the 2016 BC Summer Provincial Diving Championships at the Grandview Aquatic Centre in Surrey, B.C., May 27-29. Bainbridge Island Diving Club’s Henry Sauermann won the 3-meter springboard at the Winter Provincial Diving Championships, Feb. 11-14 in Victoria, B.C. Sauermann, competing in the 12-13 age group, had a score of 160.50. He also placed second in the 1-meter with a score of 161.85. Teammate Brian Taylor was third in the 3-meter (151.30) and seventh in the 1-meter (121.90). Zora Opalka won the 15-18 3-meter with a score of 316.35 and was sixth in the 1-meter (331.35). She also competed in the Open event and placed seventh with a score of 177.0. Jackie Hellmers won the 16-18 Junior Division 1-meter with a score of 219.80 and placed third in the 3-meter (232.70). Cammy Rouser placed second in the 3-meter (279.90) and finished seventh in the 1-meter (252.75). In the 12-13 girls age group, Bryn Tiernan placed fourth in the 1-meter with a score of 171.45 and fifth in the 3-meter (176.30). Mia Alpaugh finished in fifth place in the 1-meter (98.45) and Morgan Dunscombe placed sixth (85.55). In the 3-meter, Alpaugh placed seventh (107.80). It was the first international meet for Alpaugh and Dunscombe. Masters diver Theresa Raleigh placed 12th on the 3-meter with a score of 120.60 and was 13th in the 1-meter (152.0). BIDC travels to Boise, Idaho, next for an invitational meet as a warm up for the U.S. 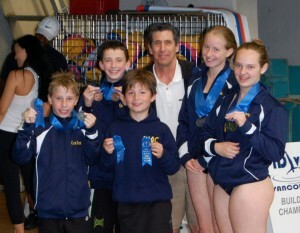 Diving Junior Olympic Regional Championships in Salt Lake City, Utah, in April. Two members of the Bainbridge Island Dive Club, Zora Opalka and Henry Sauermann, won events at the BC Summer Provincials Dive Meet last weekend in Victoria, B.C., Canada. Opalka, of Bainbridge, had a score of 391.65 on the 3-meter springboard in the 16-18 year-old division. She also placed seventh on the 1-meter (322.15). Sauermann, of Bainbridge, won the 3-meter with a score of 203.55 and also earned a silver medal on the 1-meter with a score of 176.20. BIDC teammate Cammie Rouser, of Kingston, earned silver in the 3-meter (331.15) and ninth on the 1-meter (278.40). Poulsbo’s Jackie Hellmers, competing in the 14-15 year-old division, finished second on the 3-meter with a score of 240.95 and fourth on the 1-meter (235.20). In the 11-12 division, Bryn Tiernan of Bainbridge earned a bronze on both the 1-meter (162.30) and 3-meter (140.25). Both Sauermann and Tiernan qualified for the USA Diving National Preliminary Zone E Championships in Beaverton, Oregon, June 9-12. Bryn Tiernan and Henry Sauerman of the Bainbridge Island Dive Club advanced to the USA Diving Zone D Championships in June in Beaverton, Oregon, after qualifying at the Junior Region 10 Championships last weekend in Beaverton. Tiernan and Sauerman each advanced to the zone meet in the 1-meter and 3-meter springboards. Tiernan placed 10th in the 3M with a score of 123.70 and 12th in the 1M (110.80) in the 11-and-under division. Sauerman, competing in the 12-13 division, was seventh in both the 1M (152.5) and 3M (152.85). In the girls 14-15, Jackie Hellmers, of Poulsbo, placed 19th in the 1M (162.85) and 19th in the 3M (195.65). Zora Opalka, Bainbridge, was 32nd in the IM (166.10) and 24th in the 3M (325.6) in the 16-18 division. Cammie Rouser, Kingston, finished 33rd in the 3M (295.60) and 42nd in the 1M (132.90). The regional meet featured divers from Washington, Oregon, Idaho, Alaska, California, Nevada, Texas and Hawaii. BIDC, which includes divers from Kingston, Poulsbo and the island, will travel to a meet in Victoria, B.C., Canada in May and the the zone meet, June 19-24. Three members of the Bainbridge Island Dive Club returned from the YMCA Spring Classic in Boise last week with first-place ribbons. Jackie Hellmers of Poulsbo won the 3-meter springboard in the girls 14-15 year-old division with a score of 228.95 points. She was also second in the 1-meter (194.50). Henry Sauermann of Bainbridge scored a win in the 3-meter with a final tally of 190.40 in the 12-13 year-old category and Carter Wolff, also of Bainbridge, placed first in the 1-meter with a score of 118.20 in the FC Level 4 division. Also placing among the top competitors were Zora Opalka of Bainbridge, who was second in the 1-meter (334.5) and fourth in the 3-meter (339.15) in the 16-18 year-old division. Cammie Rouse of Kingston was third in the 3-meter (350.45) and fourth in the 1-meter (301.65) in the same division. BIDC will compete in the U.S. Diving Regional Championships in Beaverton, Oregon, next month.